This is Naked Capitalism fundraising week. 564 donors have already invested in our efforts to shed light on the dark and seamy corners of finance. Join us and participate via our Tip Jar or another credit card portal, WePay in the right column, or read about why we’re doing this fundraiser and other ways to donate, such as by check, as well as our current goal, on our kickoff post. And read about our current target here. On Thursday, a former bank examiner at the Federal Reserve Bank of New York, Carmen Segarra, filed a suit (embedded at the end of this post) against the New York Fed and several of its employees alleging, among other things, improper termination. The complaint is a doozy and some of the additional details supplied by Segarra to ProPublica make an already ugly picture look even worse. Mind you, this is only a partial description of the extent of the stonewalling and internal sabotage that Segarrra faced. If you read the account at the New York Times’s Dealbook, you get only a watered-down version of the allegations and a whisper campaign from the New York Fed, with unnamed sources accusing Sagarra of being subject to “conspiracy theories”. 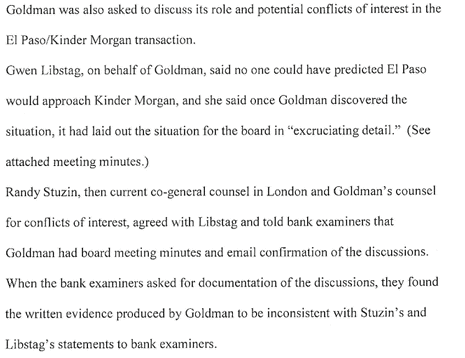 Admittedly, any smart litigant will save its response for the courtroom, but the sad part is that the New York Fed may be so deeply captured by the banks that anyone who is serious about looking into possible misconduct must be crazy. After all, banks like Goldman have good intentions and anything that looks like misconduct is just an honest misunderstanding. But there’s one mention in the complaint (numbered para 74) which is the linchpin as to why the examination regime is so diseased. 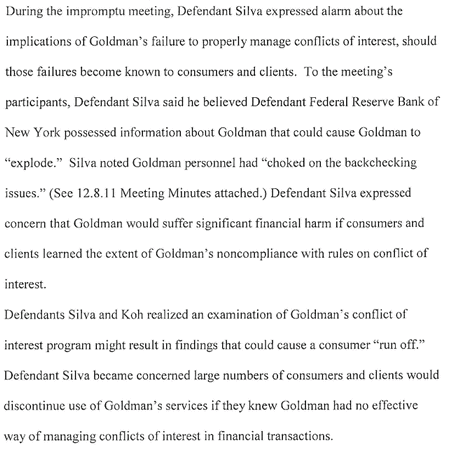 Goldman (which does not hesitate to make threats) threatened it would “waive privilege” if Segarra kept being so inquisitive. I don’t think this is exactly what Silva meant to convey, since my reading is that only the bank examiner or regulator can waive privilege. So what I read this threat as saying that if the Fed persisted, Goldman would not longer operate as if future communications on the El Paso/Kindler Morgan matter were privileged, ie, it would act as if the New York Fed were a hostile outside party who would need to compel document production and further responses to questions via subpoena.